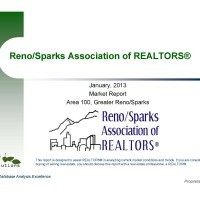 The January real estate stats are out thanks to the Reno/Sparks Association of Realtors. You can view the full report by clicking the picture to the right or watching the video at the bottom of the post. Uh Oh! The median sales price was down 3.2% from December 2012… but still up 33.3% from January 2012. New listings were up 28.4% from December 2013 but still down 32.8% from January 2012. 215 of the new 389 listing were regular sales while 132 were short sales. Only 37 were REO. Month’s supply of inventory rose to 4.6 months. Still a seller’s market. Oh yeah… the sale to list price ratio was above 100%. Meaning homes sold for more than asking price. Posted in For Buyers, For Sellers, Market Update, News and tagged is it a good time to sell in reno, reno listing broker agent realtor, reno real estate agent broker short sale, reno real estate stats, reno reale state market news.